Size: 37 ml (1.25 oz) A muted yellow with a cool, greenish tint. Sometimes used as the cool version of a yellow in many palettes. Highly opaque with a high tinting strength, it holds up well when mixing. Useful for painting natural light. Size: 37 ml (1.25 oz) An intense yellow with a cool tint. Often used as the cool version of a yellow in many palettes. Less opaque than Nickel Titanate Yellow, Zinc Yellow still maintains a high tinting strength. A great all-purpose cool yellow. Size: 37 ml (1.25 oz) A neutral yellow with a high tinting strength. A great basic color for most palettes. Highly opaque, it holds up well when mixing. Useful for most mixes and a good all-purpose yellow. Size: 37 ml (1.25 oz) Bismuth Yellow falls into the neutral range in color temperature, although it is slightly cooler than Cadmium Yellow Pale. Like the Cadmium Yellow Pale, it is bright and has a high tinting strength, but it is less opaque which makes for beautiful mixes with depth and brilliance. Introduced to the Pre-tested line in 2014. Size: 37 ml (1.25 oz) A clean, bright masstone, Hansa Yellow makes a good choice for mixing secondary colors. Warmer than Bismuth Yellow, but less intense than Cadmium Yellow Light, Hansa Yellow is also more transparent than its neighbors on the color spectrum. Hansa Yellow is a staple choice for a warmer yellow in a primary palette. Introduced to the Pre-tested line in 2014. Size: 37 ml (1.25 oz) Pre-tested Professionals Cadmium Yellow Light is warmer on the temperature scale than many others on the market. Its a bright, sunny yellow that mixes well with other primaries to create strong secondary colors. Like other cadmiums in the range, it boasts a high tinting strength. Its a favorite choice for a warm primary yellow in many palettes. Size: 37 ml (1.25 oz) Also known as Cobalt Yellow, Aureolin is a less intense yellow that is slightly warmer than neutral on the temperature spectrum. Transparent, and with a low tinting strength, Aureolin makes nice glazes and works well for mixes that require a weaker yellow than the Cadmiums offer. Size: 37 ml (1.25 oz) A very warm yellow that approaches orange, its a bright, highly opaque color with a high tinting strength. Size: 37 ml (1.25 oz) A highly opaque orangey-yellow that is slightly more muted than its neighbors on the color spectrum. It is a rich color with a high tinting strength. Size: 37 ml (1.25 oz) A brighter, more transparent orangey-yellow than Cadmium Yellow Deep. Creates clean mixes with a moderate tinting strength. Size: 37 ml (1.25 oz) A neutral orange between the warmer yellows and redder oranges in the Pre-tested Professional spectrum. Pumpkin-like in color, it is highly opaque with a moderate tinting strength. Mixes with other colors cleanly to create bright tertiary colors. Size: 37 ml (1.25 oz) A warm yellow with an orange bias, this color can be used like a deepened Naples Yellow. Creates a variety of peach tints, perfect for still life, floral and portrait painting. Size: 37 ml (1.25 oz) A rich, complex orange that falls in the warm temperature range when used straight out of the tube, but falls into the cooler range when mixed with white. Slightly muted, this color still radiates an-intensity when used alone. The transparent nature of this orange creates delicate mixtures, blends and glazes. Size: 37 ml (1.25 oz) A highly opaque, warm Vermilion color, Monoazo Orange has a moderate tinting strength and superior brightness when compared to Cadmiums. Size: 37 ml (1.25 oz) A semi-opaque peachy pink that can be used as a base color for mixing fair to medium skin tones. Pale Pink boasts a high tinting strength and falls in the warmer temperature range. Size: 37 ml (1.25 oz) A warm red that is slightly muted. Cadmium red light has been a staple warm red in color palettes for decades. Cadmium Red has a moderate tinting strength and is highly opaque, which makes for strong secondary colors. Size: 37 ml (1.25 oz) A rich, fiery red that falls in the warm temperature spectrum when used straight from the tube, but turns cooler when mixed with white. Semi-opaque, Pyrrole Red t is highly lightfast and more delicate in mixtures than Cadmium Red Light. 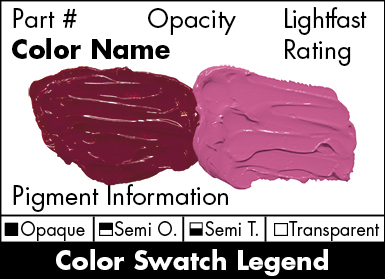 A modern color innovation, this color was introduced to the Pre-tested professional line in 2014. Size: 37 ml (1.25 oz) Also known as Napthol Red, Grumbacher Red is a neutral red mid-range between the warm reds and the cool reds in the Pre-tested Professional color spectrum. When mixed with white, Grumbacher Red takes on a slight blue cast. This is a bright, intense, opaque color that is used as a primary red in many color palettes as it makes solid secondary mixes. Size: 37 ml (1.25 oz) A neutral red similar to Grumbacher red, with a slight warm cast when mixed with white and becomes more muted. Opaque with a high tinting strength, this color is also used as a primary red in many color palettes as it makes solid secondary mixes. Size: 37 ml (1.25 oz) A cool, intense red with a moderate tinting strength, this color is semi-opaque and is slightly more complex than the Cadmiums when used straight from the tube. When mixed with white, Quinacridone Red becomes more muted. Can be used in place of Alizarin Crimson when a stronger and brighter mixture is desired. Size: 37 ml (1.25 oz) A particularly dark version of Alizarin that has a rich Violet cast. It enjoys excellent tinting strength. Like Alizarin Crimson, this color is not considered lightfast by contemporary standards. However, it may be considered to be reasonably safe to use in reductions of less than 50%. Size: 37 ml (1.25 oz) Also known as Permanent Rose, Thalo® Red Rose is a cool, bright red with a lower tinting strength and higher transparency than Quinacridone Red. This color creates brilliant secondary colors when used as a mixture and works well as a glaze. Thalo® Red Rose is a popular cool red substitute for Alizarin Crimson in primary palettes when a brighter red is desired. Size: 37 ml (1.25 oz) A deep, neutral red with a high tinting strength. Cadmium Red Medium has a very muted tint, and is highly opaque. A great red for use in Renaissance palettes where more muted tones are desired. Size: 37 ml (1.25 oz) A rich and complex red with a semi-transparent opacity. Perylene falls in the neutral range of the temperature spectrum as it has a cooler quality while also displaying yellow undertones. When mixed with white, Perylene Red maintains its brightness without losing intensity. An excellent substitution for Alizarin Crimson when creating warmer skin tones. 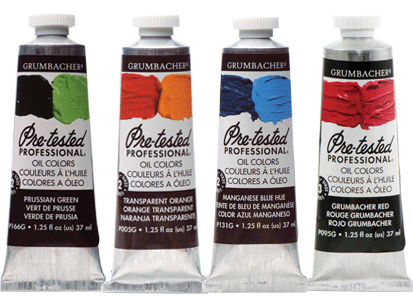 One of the more modern colors introduced to oil paint it was inducted into the Pre-tested Professional line in 2014. Size: 37 ml (1.25 oz) A rich, earthy red that grays out in tints. Highly opaque with a strong tinting strength, this color falls in the neutral zone of the temperature spectrum in masstone, but becomes cooler in tints. Size: 37 ml (1.25 oz) A reddish semi-transparent brown perfect for glazing and an excellent muted substitute for Alizarin Crimson. A nice addition to a floral or portrait palette, and creates beautiful shadows for items painted with Cadmium Red. Size: 37 ml (1.25 oz) Reminiscent of crushed blackberries, Brown Madder is a deep, cool red that is muted in tints. The semi-opaque nature of Brown Madder creates excellent glazes for figure painting and portraiture. Size: 37 ml (1.25 oz) A cool, transparent red that has limited lightfastness. Low tinting strength, Rose Madder loses intensity when mixed with white. Works well in mixes and is essential for creating glazes in portrait painting, and in landscapes where the sun is low on the horizon and a warm glow is desired. Rose Madder is also commonly used in floral paintings as it is ideal for shadow and midtone transition areas on petals. Size: 37 ml (1.25 oz) A cool, deep cabernet color, Alizarin Crimson Golden is slightly more yellow than the more commonly used Alizarin Crimson. While very similar in masstone, Alizarin Crimson Golden becomes warmer in tints and can be substituted for Alizarin Crimson in most cases. Transparent, Alizarin Crimson Golden has a wide range of uses from skin tone mixtures and glazes to floral paintings and more. Size: 37 ml (1.25 oz) A must-have for any palette, Alizarin Crimson is most often used as the cool red in primary color palettes. It is highly versatile in mixing secondary colors, earth tones, skin tones, and more. Transparent, it is similar to Alizarin Crimson Golden in most properties and uses although becomes cooler in tints. Size: 37 ml (1.25 oz) Also known as Quinacridone Magenta, Thio Violet is a transparent, jammy purple-red. It is a clean, intense magenta that maintains brightness in tints. A low tinting strength makes it ideal for glazes. Size: 37 ml (1.25 oz) A unique permanent form of ultramarine that has a mid-range, dull red violet masstone and a characteristic low tinting strength that makes brilliant glazes. Because of its low tinting strength it is easy to control in muting bright greens and in creating shadows. Size: 37 ml (1.25 oz) The most transparent color in the Pre-tested Professional line, Cobalt Rose is a subtle magenta color that quickly loses strength in tints. Creates delicate mixes and glazes and is a favorite amongst floral painters. Size: 37 ml (1.25 oz) Highly transparent with red undertones, Cobalt Violet creates a warm lavender in tints. When used as a glaze, Cobalt Violet can add a glowing quality to shadows. Size: 37 ml (1.25 oz) One of the most commonly used purples in oil painting, Dioxazine is a rich, complex color that is very dark in masstone  so much so that it is sometimes used as a black. Creates vibrant tints when mixed with white. Its very cool on the temperature spectrum with an extremely high tinting strength that can quickly overpower other colors in mixes, its advisable to use sparingly. Size: 37 ml (1.25 oz) A cool grayish-purple that is highly transparent and may be considered the counter point to the warmer Cobalt Violet. Creates a grey-lavender in tints, and glazes ideal for shadow work. Size: 37 ml (1.25 oz) Very similar to French Ultramarine, it is slightly warmer and more muted when mixed with white. Size: 37 ml (1.25 oz) A crisp, cool blue that is a staple in primary palettes. Creates beautiful violets when mixed with cool reds, especially with Alizarin Crimson, and makes brilliant greens when mixed with cool yellows like Zinc or Bismuth. Retains brightness in tints with a moderate tinting strength due to its semi-opaque nature. Size: 37 ml (1.25 oz) Nearly identical to French Ultramarine Blue, but slightly more transparent and deeper in masstone. Can be substituted for French Ultramarine in most cases where a higher degree of transparency is desired. Size: 37 ml (1.25 oz) A deep, intense, yellow-undertone blue with an iridescent sheen. Extremely dark in masstone, it can be used as a cool black. Very powerful tinting strength can overpower mixes and should be used in small amounts. Brilliant greens can be achieved when mixed with cool yellows like Bismuth or Zinc. Semi-opaque, small amounts create beautiful, complex glazes. Although not a staple in primary palettes due to its tinting strength it is a common item found in most painting studios. Size: 37 ml (1.25 oz) A deep, warm blue also known as Anthraquinone Blue. Like Thalo Blue, a little bit goes a long way and can overpower mixes. Indanthrone Blue is an opaque color that is highly lightfast with a high tinting strength, remains vibrant even in tints. Size: 37 ml (1.25 oz) A deep, muted blue that falls mid range in the temperature spectrum. It is slightly warmer than Thalo Blue but cooler than Indantrhone. Semi-opaque with a slight iridescent quality, Prussian Blue has been in artists' palettes for over 3 centuries. When mixed with white, tints have a lovely smoky quality which carries over to glazes as well. Size: 37 ml (1.25 oz) A black-blue with a very muted tint, Indigo falls slightly on the warmer side of the temperature spectrum. Pre-tested Professional Indigo is a true indigo and is opaque with a high tinting strength. This color is ideal for mixing shades and deepening colors. Size: 37 ml (1.25 oz) Far more muted than traditional Cobalt, Cobalt Blue Deep is also redder in tone. Its a semi-transparent color that works well for glazing and deepening tones in mixes. It has a moderate tinting strength and takes on a smoky quality when mixed with white, which can be ideal for sky-work. Introduced to the Pre-tested Professional line in 2014. Size: 37 ml (1.25 oz) A clear, intense blue that is difficult to obtain my mixing. Maintains chroma well in tints, and shifts from a cool blue in masstone to a bright blue with slight red undertones in tints. A good investment, as it is great for mixing or used by itself. Size: 37 ml (1.25 oz) Named by a Grumbacher artist through our Facebook page contest, Arctic Blue is a unique color to the Pre-tested Professional range. It is a soft, pastel blue muted in tone with a slight greenish-gray cast. It falls mid-range on the temperature spectrum for blues. Although highly opaque, it has a low tinting strength that creates delicate tints and creamy mixes. A beautiful color for sky-work and highlights in seascapes. Introduced to the Pre-tested Professional line in 2014. Size: 37 ml (1.25 oz) A semi-opaque blue that falls mid-range on the temperature spectrum. It is slightly redder than Cerulean Blue Hue. It has a low tinting strength and is semi-opaque. Ceulean Blue mixes well with other blues and whites and has been used extensively by artists to create skies in landscape work. Size: 37 ml (1.25 oz) A vibrant blue with yellow undertones, Manganese Blue falls on the cooler end of the temperature spectrum. With a semi-opaque transparency and low tinting strength, this color is often used in mixes as it maintains its brightness. Manganese Blue is often used for water and sky work. Size: 37 ml (1.25 oz) Slightly cooler than traditional Cerulean Blue, this hue has more of a yellow cast. In masstone it is somewhat muted, although brightens considerably when mixed with white. An opaque color, it has a low tinting strength which mixes well with other blues and whites for water and sky work in landscapes. Size: 37 ml (1.25 oz) A turquoise that falls on the cooler end of the temperature spectrum as it displays yellow undertones. Its a vibrant, opaque color that maintains brightness in tints. Because of its fairly low tinting strength, it blends easily and creates beautiful glazes and subtle mixes. Size: 37 ml (1.25 oz) Magnesium Green, also known as Cerulean Blue Chrome, is a muted green blue with high opacity. Best used by itself, it is a popular color for pop artists, art nouveau and art deco work. Size: 37 ml (1.25 oz) A deep sea green, this opaque color has a dusky, muted quality. With a low tinting strength, it mixes well with other yellow-toned blues and greens and is often used in seascapes as it creates beautiful glazes which add translucent depth to waves. Size: 37 ml (1.25 oz) A deep semi-transparent green that is often used as a cool green in many palettes. It mixes incredibly well to create rich tertiary colors and glazes. Slightly muted, Viridian has often been a staple for painting the natural world. Size: 37 ml (1.25 oz) A permanent, opaque, fairly bright, lightfast metallic oxide Blue Green of medium saturation that has a relatively low tinting strength. It has been in use since 1835 and has proven to be useful in depicting foliage and because it is easy to control, it is ideal for muting European Flesh Tones in portraiture. Size: 37 ml (1.25 oz) As its name implies, this is a bright, intense green color that is a more vibrant and opaque version of Viridian. It maintains chroma in tints which makes it ideal for mixing tertiary colors or adding richness to other green tones. Size: 37 ml (1.25 oz) A deep emerald green with strong blue undertones, this color is semi-opaque with a high tinting strength. When mixed with white it maintains a slightly muted quality making it a favorite choice for painting the natural world. When used for glazing, it can create rich, dramatic shadowing. Size: 37 ml (1.25 oz) A deep mossy green with yellow undertones, this color is semi-opaque with a high tinting strength. When mixed with white it maintains a clear, clean tint, and is valued for its mixing qualities and for glazing. Like other Thalo colors, this green can be overpowering in mixes and its advised to use it in small amounts. Size: 37 ml (1.25 oz) Very muted, Chromium Oxide Green is a very earthy, opaque green with yellow undertones. It has a moderate tinting strength and is a favorite amongst landscape painters as it is soft, natural green that blends easily and can be made slightly warmer or cooler depending on the colors it is mixed with. Size: 37 ml (1.25 oz) More muted than its bright cousin, Permanent Green Light is reminiscent of mid-summer leaves. Its moderate tinting strength makes it ideal for mixing and is a favorite amongst landscape painters. Size: 37 ml (1.25 oz) A muted, sea green with high opacity and tinting strength, it is often used in landscape and seascape painting. When mixed with white, it has a creamy pastel quality that is excellent for dense highlights. Size: 37 ml (1.25 oz) Darker than Cadmium Green Light and Permanent Green Light. It is a deep green with a yellow undertone that is extremely opaque. Great for direct painting, mixing, and abstract work. Size: 37 ml (1.25 oz) A workhorse on the painters palette, Sap green is a neutral green with yellow undertones that can easily shift to warm or cool depending on the colors it is mixed with. Semi-opaque with a moderate tinting strength, Sap Green is a staple mixing green for colors in the natural world as it has a slight muted quality that still maintains chroma in tints and shades. Size: 37 ml (1.25 oz) A wonderful mixing green, this green is evocative of Spanish olives. It mixes cleanly, creating surprisingly bright tints. It is considerably warmer than Sap Green and more transparent. This green is very useful in landscape and seascape painting. Size: 37 ml (1.25 oz) A medium toned green with slightly muted qualities. It mixes well with other greens to create rich landscapes. When used in tints lime tones can be achieved. In the temperature spectrum it falls mid-range between the cool-blue greens and the warm yellow-greens. Size: 37 ml (1.25 oz) An intensely bright lime green that borders on neon, Thalo Yellow Green is a favorite for painting the new growth of spring shoots and leaves. With a high tinting strength, this color sings when mixed with white. When mixed with warm yellows, it creates beautiful chartreuse tones reminiscent of Granny Smith apples, also works beautifully in glazes for shadow work in yellow floral paintings. Size: 37 ml (1.25 oz) A semi-opaque khaki green, it creates warm glowing tones when used for glazing. Excellent for landscape painting it mixes and blends easily with other greens. Tinting with Green Gold creates a warm, muted chartreuse. Size: 37 ml (1.25 oz) A deep, earthy green that falls mid-range on the temperature spectrum. Semi-transparent, it creates a soft sage when mixed with white. Creates beautiful glazes and is often used in landscape painting. Size: 37 ml (1.25 oz) Almost black in masstone, Greenish Umber is an opaque, cool green color used in many Renaissance palettes. It maintains a very high tinting strength and creates a smoky slate gray when mixed with white. Excellent for use in landscape and seascape paintings. Size: 37 ml (1.25 oz) A deep mid-tone green with yellow-gray undertones, it is semi-transparent making it excellent for glazing. In tints it has a cool, hazy atmospheric quality evocative of distant forests. Size: 37 ml (1.25 oz) A cool charcoal color in masstone, Davys Gray has a greenish cast similar to Greenish Umber. Often used to paint stone or rock this, Davys Gray becomes slate or gunmetal in tints. Size: 37 ml (1.25 oz) A staple deep brown earth tone, Raw Umber is a semi-opaque neutral brown with yellow undertones in masstone, but cool grey undetones in tints. Used in mixes, glazes and straight from the tube in a variety of subjects from landscapes to portraiture. Size: 37 ml (1.25 oz) Warmer than Raw Umber, Burnt Umber takes on a reddish cast. In tints, Burnt Umber takes on a soft cashmere tone. This color is often used in portrait work as well as paintings of the natural world. Mixes well with other colors to make deeper tones, especially other earth tones, greens and yellows which makes it ideal for landscape painting. Size: 37 ml (1.25 oz) Introduced in 2014, Terra was named by a Grumbacher artist through a contest on our Facebook page. Its a warm chocolaty-brown with yellow undertones. It maintains chroma in tints, and is excellent for mixing skin tones. Size: 37 ml (1.25 oz) Also known as burnt orange, Quinacridone Orange is a clear, muted pumpkin color that becomes a baked earth-like shade when mixed with white. Mixes cleanly with other colors and works well when developing ruddier areas in skin tones. Size: 37 ml (1.25 oz) A semi-transparent rust color, it is a transparent version of Indian Red. Mix with a small amount of Alizarin Crimson to match the cool tones of Indian Red, as Transparent Red Iron Oxide has yellow-orange undertones. Very useful in creating glazes for portraiture. Size: 37 ml (1.25 oz) A classic color in Renaissance Palettes and extremely popular in portraiture painting, Venetian Red is an opaque brick color that falls in the mid-range of the temperature scale. Can be cooled by the addition of an Alizarin Crimson or warmed by adding Pyrrole. Excellent in mixing skin tones and for use as a glazing color. Size: 37 ml (1.25 oz) Slightly cooler than Venetian Red, Indian Red is a more opaque version of Transparent Red Iron Oxide. Used frequently in landscape, portrait, fauna paintings. Size: 37 ml (1.25 oz) An opaque warm red that creates a muted pink tone in tints. Used frequently in portraiture as it mixes well with other colors to create realistic skin tones. Also works beautifully in glazes. Size: 37 ml (1.25 oz) A rich, semi-opaque brown with warmer tones than the Umbers. Mixes cleanly with other colors without graying out. Excellent addition to a skin tone palette or whereever a darker, more intense version of Burnt Sienna is desired. Size: 37 ml (1.25 oz) A standard color on most palettes, Burnt Sienna is a warm brown with high tinting strength and a semi-transparent opacity rating. A versatile earth tone, it is used in a wide range of painting techniques from masstone to mixes and glazes. Size: 37 ml (1.25 oz) A golden-orange-brown color that is highly transparent. When mixed with white it creates tints similar to gold ochre. Brown Pink is very versatile color for mixing skin tones and for floral work. Size: 37 ml (1.25 oz) A traditional brown found in most palettes as it is highly versatile in mixing. Semi-opaque with a moderate tinting strength, it mixes well with other colors to make realistic skin tones. Its also a workhorse for making glazes for shadows, in landscapes and in other works depicting the natural world. Size: 37 ml (1.25 oz) A transparent version of Gold Ochre, its a warm, earthy yellow that is excellent for glazes. Size: 37 ml (1.25 oz) Slightly redder and more opaque than Transparent Yellow Iron Oxide, Gold Ochre is also a deeper color than Yellow Ochre. Excellent for mixing skin tones, Gold Ochre is also widely used for pale landscapes and mixes used in depicting hair and fur. Size: 37 ml (1.25 oz) A warm, light earth tone with heavy yellow undertones, Yellow Ochre is a staple in creating skin tones. Its also widely used in landscapes, florals, and Renaissance palettes. Size: 37 ml (1.25 oz) A sunny, muted yellow with a high tinting strength. When mixed with white Naples Yellow displays slight red undertones. Old masters have used Naples yellow for creating atmospheric distance in landscapes as well as in mixes for skin tones. Size: 37 ml (1.25 oz) A soft, natural flax color also called Titanium Buff, it falls fairly neutral on the temperature spectrum. It maintains a high tinting strength and shifts very little when mixed with white. A popular color in portrait and landscape work. Size: 37 ml (1.25 oz) A clean, slow drying white ideal for alla prima painting. Its less opaque than Titanium White, which makes it an attractive alternative for mixing tints when subtle shifts are desired. Its transparency also makes it ideal for glazing, and scumbling. Zinc White has a tendency to yellow slightly over time when used straight from the tube. Consider using Superba White for masstone work. Size: 37 ml (1.25 oz) A highly opaque white with a stiffer consistency than Titanium White Soft, it creates velvety, matte texture when dry. It boasts the highest tinting power of all the white except for Superba, which would be its equal in tinting strength. Titanium White has a tendency to yellow slightly over time when used straight from the tube. Consider using Superba White for masstone work. Size: 37 ml (1.25 oz) The same highly opaque properties as the original Titanium White with a softer consistency that is easier to mix although provides less body than the original Titanium White. Dries to an eggshell sheen. Titanium White Soft has a tendancy to yellow with time. Consider using Superba White for masstone work. Size: 37 ml (1.25 oz) A highly opaque, non-yellowing titanium white, Superba uses a proprietary blend of oils that resists yellowing over time. Superba has the same look and feel as Titanium White Soft. Size: 37 ml (1.25 oz) A very deep brown-black color in masstone, Van Dyck Brown has a moderate tinting strength. When mixed with white, a warm oyster gray color can be achieved. Semi-opaque this color is wonderful in creating glazes and for shadow work. Size: 37 ml (1.25 oz) Vine Black belongs to groups of blacks made by burning grape vines, cork, and other woods or vegetable products. The way these are produced means they're a great choice for the compassionate consumer - no animal products were used to create this black! These types of blacks tend to have a strong bluish undertone, less intense and deep compared to their carbon counterparts. Vine Black has less popularity due to reputation alone - that of being less pure and inferior to other blacks. Although it is slightly less lightfast, it is still a very useful black to use especially in portraiture. Because it has a low tinting strength, and produces a subtle cool gray, it is excellent for toning down flesh tones without dirtying the color. Size: 37 ml (1.25 oz) A neutral black with a low tinting strength makes it ideal for mixing shades and for glazing. Size: 37 ml (1.25 oz) A very cool black, Paynes Gray takes on a bluish-slate cast when mixed with white. Less intense when mixed with other colors, it is a favorite alternative to traditional blacks when creating glazes and shades. Size: 37 ml (1.25 oz) A very intense neutral black with a high opacity and tinting strength. Only subtle shifts occur when mixed with white, although attractive shades of deep charcoal can be achieved. High coverage, dense color that should be used in small quantities. Size: 37 ml (1.25 oz) A deep, cool black with the highest tinting strength of any black in the Pre-tested Professional line. Very subtle shifts occur when mixed with white, revealing the cool undertones of this black. Ideal for alla prima work, Mars black is highly opaque and dries to a matte sheen. Size: 150 ml (5 oz) Pre-tested Professionals Cadmium Yellow Light is warmer on the temperature scale than many others on the market. Its a bright, sunny yellow that mixes well with other primaries to create strong secondary colors. Like other cadmiums in the range, it boasts a high tinting strength. Its a favorite choice for a warm primary yellow in many palettes. Size: 150 ml (5 oz) A very warm yellow that approaches orange, its a bright, highly opaque color with a high tinting strength. Size: 150 ml (5 oz) A warm red that is slightly muted. Cadmium red light has been a staple warm red in color palettes for decades. Cadmium Red has a moderate tinting strength and is highly opaque, which makes for strong secondary colors. Size: 150 ml (5 oz) Also known as Napthol Red, Grumbacher Red is a neutral red mid-range between the warm reds and the cool reds in the Pre-tested Professional color spectrum. When mixed with white, Grumbacher Red takes on a slight blue cast. This is a bright, intense, opaque color that is used as a primary red in many color palettes as it makes solid secondary mixes. Size: 150 ml (5 oz) A must-have for any palette, Alizarin Crimson is most often used as the cool red in primary color palettes. It is highly versatile in mixing secondary colors, earth tones, skin tones, and more. Transparent, it is similar to Alizarin Crimson Golden in most properties and uses although becomes cooler in tints. Size: 150 ml (5 oz) A crisp, cool blue that is a staple in primary palettes. Creates beautiful violets when mixed with cool reds, especially with Alizarin Crimson, and makes brilliant greens when mixed with cool yellows like Zinc or Bismuth. Retains brightness in tints with a moderate tinting strength due to its semi-opaque nature. Size: 150 ml (5 oz) A deep, intense, yellow-undertone blue with an iridescent sheen. Extremely dark in masstone, it can be used as a cool black. Very powerful tinting strength can overpower mixes and should be used in small amounts. Brilliant greens can be achieved when mixed with cool yellows like Bismuth or Zinc. Semi-opaque, small amounts create beautiful, complex glazes. Although not a staple in primary palettes due to its tinting strength it is a common item found in most painting studios. Size: 150 ml (5 oz) A deep, muted blue that falls mid range in the temperature spectrum. It is slightly warmer than Thalo Blue but cooler than Indantrhone. Semi-opaque with a slight iridescent quality, Prussian Blue has been in artists' palettes for over 3 centuries. When mixed with white, tints have a lovely smoky quality which carries over to glazes as well. Size: 150 ml (5 oz) A clear, intense blue that is difficult to obtain my mixing. Maintains chroma well in tints, and shifts from a cool blue in masstone to a bright blue with slight red undertones in tints. A good investment, as it is great for mixing or used by itself. Size: 150 ml (5 oz) A deep semi-transparent green that is often used as a cool green in many palettes. It mixes incredibly well to create rich tertiary colors and glazes. Slightly muted, Viridian has often been a staple for painting the natural world. Size: 150 ml (5 oz) A workhorse on the painters palette, Sap green is a neutral green with yellow undertones that can easily shift to warm or cool depending on the colors it is mixed with. Semi-opaque with a moderate tinting strength, Sap Green is a staple mixing green for colors in the natural world as it has a slight muted quality that still maintains chroma in tints and shades. Size: 150 ml (5 oz) An intensely bright lime green that borders on neon, Thalo Yellow Green is a favorite for painting the new growth of spring shoots and leaves. With a high tinting strength, this color sings when mixed with white. When mixed with warm yellows, it creates beautiful chartreuse tones reminiscent of Granny Smith apples, also works beautifully in glazes for shadow work in yellow floral paintings. Size: 150 ml (5 oz) A staple deep brown earth tone, Raw Umber is a semi-opaque neutral brown with yellow undertones in masstone, but cool grey undetones in tints. Used in mixes, glazes and straight from the tube in a variety of subjects from landscapes to portraiture. Size: 150 ml (5 oz) Warmer than Raw Umber, Burnt Umber takes on a reddish cast. In tints, Burnt Umber takes on a soft cashmere tone. This color is often used in portrait work as well as paintings of the natural world. Mixes well with other colors to make deeper tones, especially other earth tones, greens and yellows which makes it ideal for landscape painting. Size: 150 ml (5 oz) A standard color on most palettes, Burnt Sienna is a warm brown with high tinting strength and a semi-transparent opacity rating. A versatile earth tone, it is used in a wide range of painting techniques from masstone to mixes and glazes. Size: 150 ml (5 oz) A traditional brown found in most palettes as it is highly versatile in mixing. Semi-opaque with a moderate tinting strength, it mixes well with other colors to make realistic skin tones. Its also a workhorse for making glazes for shadows, in landscapes and in other works depicting the natural world. Size: 150 ml (5 oz) A warm, light earth tone with heavy yellow undertones, Yellow Ochre is a staple in creating skin tones. Its also widely used in landscapes, florals, and Renaissance palettes. Size: 150 ml (5 oz) A sunny, muted yellow with a high tinting strength. When mixed with white Naples Yellow displays slight red undertones. Old masters have used Naples yellow for creating atmospheric distance in landscapes as well as in mixes for skin tones. Size: 150 ml (5 oz) A soft, natural flax color also called Titanium Buff, it falls fairly neutral on the temperature spectrum. It maintains a high tinting strength and shifts very little when mixed with white. A popular color in portrait and landscape work. Size: 150 ml (5 oz) A clean, slow drying white ideal for alla prima painting. Its less opaque than Titanium White, which makes it an attractive alternative for mixing tints when subtle shifts are desired. Its transparency also makes it ideal for glazing, and scumbling. Zinc White has a tendency to yellow slightly over time when used straight from the tube. Consider using Superba White for masstone work. Size: 150 ml (5 oz) A highly opaque white with a stiffer consistency than Titanium White Soft, it creates velvety, matte texture when dry. It boasts the highest tinting power of all the white except for Superba, which would be its equal in tinting strength. Titanium White has a tendency to yellow slightly over time when used straight from the tube. Consider using Superba White for masstone work. Size: 150 ml (5 oz) The same highly opaque properties as the original Titanium White with a softer consistency that is easier to mix although provides less body than the original Titanium White. Dries to an eggshell sheen. Titanium White Soft has a tendancy to yellow with time. Consider using Superba White for masstone work. Size: 150 ml (5 oz) A highly opaque, non-yellowing titanium white, Superba uses a proprietary blend of oils that resists yellowing over time. Superba has the same look and feel as Titanium White Soft. Size: 150 ml (5 oz) A neutral black with a low tinting strength makes it ideal for mixing shades and for glazing.